By Digital Marketing standards, it’s an age-old question, even though it’s only been knocking around a few years. 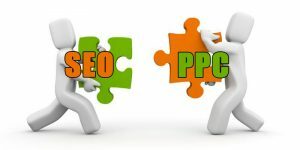 Should you concentrate on SEO or PPC to attract more website traffic and enjoy the increase in leads and conversions that brings? The actual answer is that for maximum effectiveness, your website needs a bit of both. That’s borne out by the results of a study just published, that analysed more than 80 million visits to Irish websites over the course of a year. It showed that 43% of traffic came via organic searches…and 27% were the result of a PPC (Google AdWords) campaign. On the face of it, SEO is the winner – but when analysing revenue generated, the gap narrowed. That shows why it’s important to utilise both in an effective Digital Marketing strategy. Users have greater trust in the top organic search results. They feel the site must have what they’re looking for, if Google ranks it organically on page one. On the other hand, they feel that ‘anyone can be on top with AdWords, if they pay enough’. Boosts business growth and brand awareness. Once you’re organically on page one, you’ll be visible to everybody searching for your particular products or services. It takes time. No website, no matter how good, will go straight in at number one. It’s not like how an X-Factor winner at Christmas used to be. You need talented content creators and developers to ensure all content is SEO-optimised. Putting up poorly-written and unengaging text, with pictures that aren’t tagged properly and on pages that aren’t described properly, will do nothing for you. Google constantly changes the rules. There are an estimated 500 changes in its algorithm every year – most minor, but some major. Any one of them could affect your rankings. Getting the balance right between SEO and PPC is therefore crucial for any online business, large or small, and so it’s important to engage the services of an expert Digital Marketing consultancy. That’s us. We will analyse your website’s performance to date, and the market that you’re in, and draw up a detailed plan for how you can best move forward. If your website is new, or ranks very poorly, and you need instant results, we may advise allocating a greater proportion of your budget to PPC in the short term – but we’ll also remind you of the importance of SEO for long-term growth. If you’ve already got a steady stream of traffic, leads, and conversions, we’ll probably concentrate more on the SEO effort – but we’ll point out how PPC can give you a short-term boost too. Either way, we’ll devise the most effective strategy for you. Just contact us at any time to find out more and to begin to improve your digital marketing today.